'Brown v. Board' College Grants Go to Whites. Fair? In the wake of the landmark Brown v. Board of Education decision, many Virginia public schools shut their doors rather than accept black students. Now the state is offering college scholarships to compensate those whose education suffered in the era of "massive resistance" to desegregation. Among the recipients are white students, the Washington Post reports. Since 2004, about 70 people have won the scholarships, including a handful of white Virginians whose schooling was disrupted in the late 1950s and early 1960s. A precise count of white scholarship recipients was unavailable, but the total is believed to be fewer than 10. Officials who oversee the state program say they want to spread the word to more white students who might be eligible. "Both black and white students lost an opportunity because of the state's decision, and both deserve this aid," said Brenda Edwards, who administers the Brown v. Board of Education Scholarships for the Virginia Division of Legislative Services. 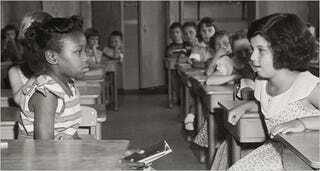 "White people hear Brown v. Board, and they think they're not eligible. We're trying to change that perception ... We want more people to get the education they missed out on years ago." The award of scholarships to whites will undoubtedly strike many as counterintuitive at best, and unfair and backward at worst. The view of one scholarship recipient who told the Post, "This was the state's chance to apologize for wrongdoing, not to award people who have never known racism" is understandable. But we think this actually communicates a poignant message that transcends the shut-down schools and the individual scholarship recipients (and that no one was thinking about at the time of Brown v. Board): It may appear that black people are the only ones who are hurt when racism and fear motivate policy decisions, but in the long term, all Americans suffer. In other news: 50 Cent to Author Anti-Bullying Novel.